Miss Print: It's Rhubarb Time Again - and the Giveaway Winners! It's Rhubarb Time Again - and the Giveaway Winners! Okay, you guys know I love rhubarb right? Growing up my grandmother grew rhubarb in her back garden and it has always been one of my favourite things! Well, yesterday Alex found me some rhubarb while at the grocery store - hurray! I've been having a hard time finding rhubarb this year (okay to be truthful I actually have trouble every year) and have been very sad because of it - but Alex came to the rescue so today I made rhubarb syrup and tomorrow I will be making Blueberry (and a little bit of) Rhubarb Muffins using the leftover rhubarb mash from the syrup. 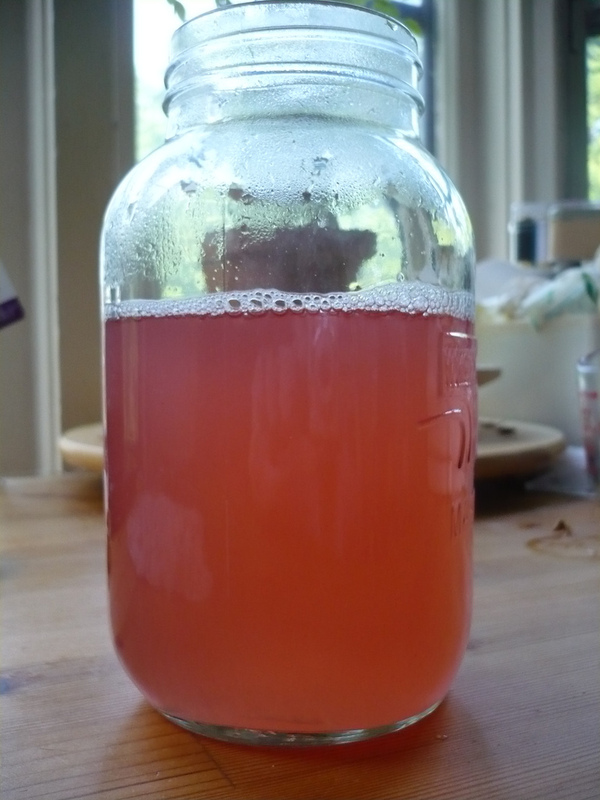 The syrup isn't quite as ruby red as last year's because the rhubarb wasn't as ripe, but it's still pretty tasty! As I'm writing this I'm drinking some of the syrup mixed with soda water - it is fantastic and I can not wait for the muffins tomorrow! and Manic Purl...and Yarn Sprout...geez, that Chrissy is everywhere! Carla of Sew it Up, Baby! Congratulations ladies! Please contact me with your mailing address and I will get the prizes out as soon as possible! And to everyone who did not win - you know you`re all winners in my book, teehee! AAAANNNNDDD, you may just want to come back to this here blog VERY soon because there will be another super-fantastic giveaway featuring some truly awesome just-released fabric! I hinted to what it could possibly be in this post! And seriously guys, you should definitely grab some rhubarb and try out the recipes they mentioned! I love the rhubarb syrup and Alex swears that the muffins are the best I`ve ever made - I think he might be more excited for the baking tomorrow than I am! By the way, are there any Blythe lovers out there? Amanda and I are swapping Blythe sized quilts with each other and was just wondering if anyone would be interested in seeing my progress or perhaps having a tutorial - let me know? Oh, I will need to look up how to do that rhubarb syrup. My mom has huge plants outside the back of her house that I can raid. I've only ever made a pie. Oh, and I'm not a Blythe person but I'm continually fascinated by all of the teeny things that people make for them. So I would love to see your quilts! Mmmm, rhubarb1 Rhubarb crumble was a family favourite when I was growing up, and then there was always the extra syrupy juice from cooking it that we got to drink mixed with lemonade. Now my own son love s it too, and asks for rhubabr every week when we see it in the supermarket, so he can have more rhubarb juice! He especially likes the froth that forms with the fizz! I love rhubarb jam! I found your great blog from the Quilters Home magazine. Congratulations on making their list. I will visit again as enjoyed reading your blog. I have tried rhubarb but it's a bit too tart for my taste. My daughter loves it! Katy and I *Heart* Kona!